This is the time of year when bounty can become a bit of a burden. Our counter is groaning under the weight of fresh produce. Who decided it was a good idea to buy four pounds of strawberries and four pounds of cherries at the same time? For the third day in a row? And, what about the radishes and the lettuce and the Japanese turnips? Who’s going to eat all those? You really can get too much of a good thing. Six months of winter (followed by six months of bad ice, as the old Canadian joke goes) leaves me craving fresh food, especially fruit and I always buy way too much, especially berries. Especially strawberries. We now have enough berries to keep a family of bears going through next April. But I blame Marysol for the figs. 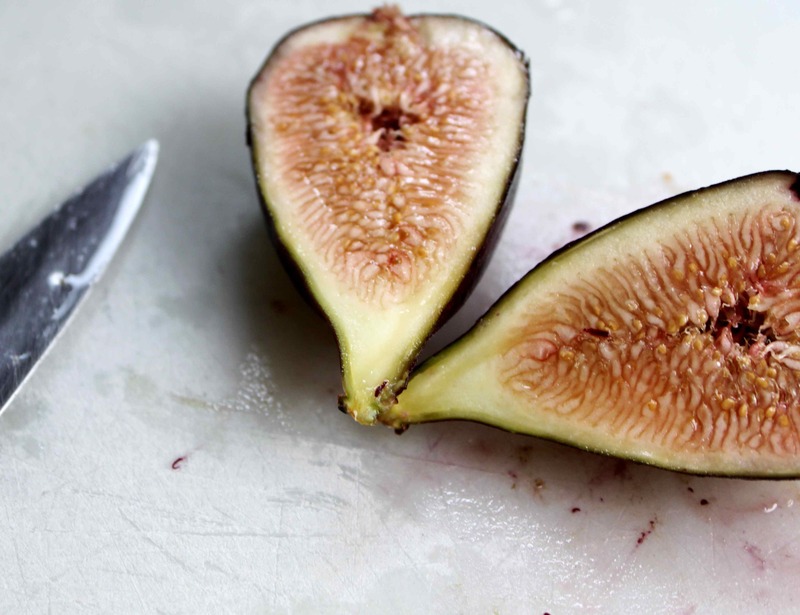 Encouraging people to buy huge flats of fresh – delicious but highly perishable – figs when they have counters, fridges and tables full of other fruit they’re trying to eat their way through is simply reckless. Fortunately for everyone, figs and strawberries get along just fine in a jam. 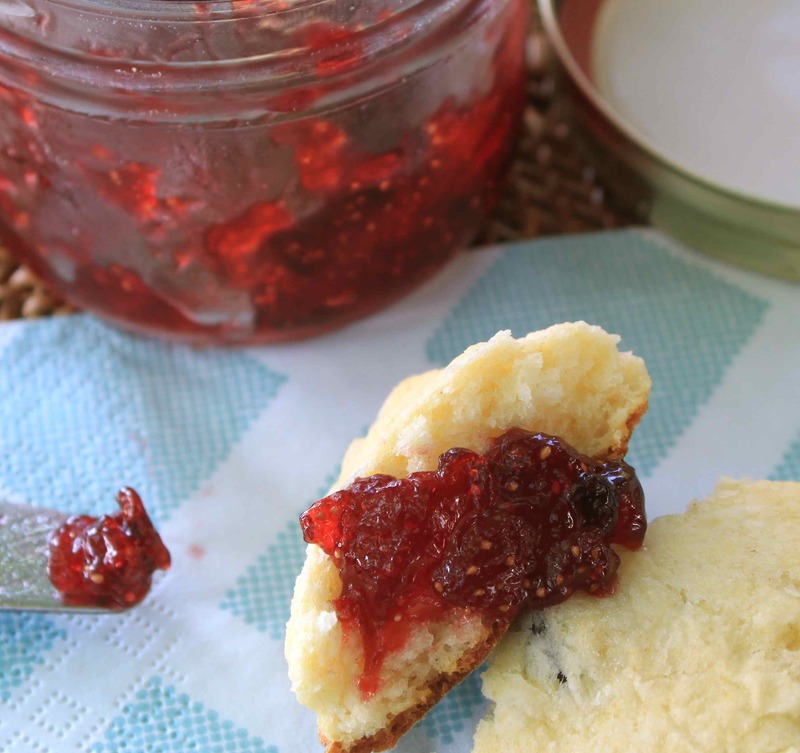 This one, from The Complete Book of Small-Batch Preserving By Ellie Topp and Margaret Howard, is equally at home on homemade scones or next to a cheese plate. Make lots, winter is long around here. Combine all ingredients in a stainless steel or enamel pan. Let stand, covered, for one hour. Stir occasionally. Place, uncovered, on high heat and bring to a boil, reduce heat to medium. Stirring occasionally, keep the mixture boiling rapidly for 15 minutes or, until the jam coats the back of a spoon thickly and forms large droplets. Ladle into hot 1-cup (250 ml) canning jars and process for 10 minutes according to the instructions here. This entry was posted in Preserves. Bookmark the permalink. I too was tempted by that ‘buying a whole flat of figs’ thanks to Marysol (bless her!) and proudly say I found the courage to resist since my counter looks like yours. I did succumb to 3 black velvet apricots instead. Equally tender and something new to try. And expensive. I hear there is a ‘Burgeoning Bounty Anonymous’ 12-step program for the likes of us. Please tell me what you do with your Japanese turnips. I found a nice soup recipe for mine but that seems so nuts in 30C and a humidex of who knows what. BTW the jam looks superb and probably goes smashingly with a cheese plate and rhubarb syrup martini. b) Anne. Apricots. I am drooling. I love apricots. YOU are tempting me.